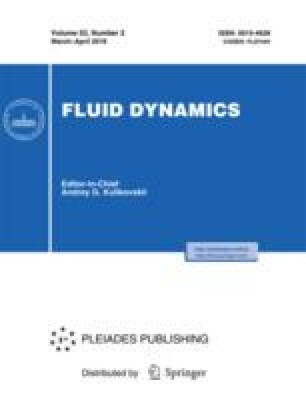 Direct numerical simulation is applied to obtain laminar-turbulent transition in supersonic flow over a flat plate. It is shown that, due to the nonlinear instability, Tollmien–Schlichting waves generated in the boundary layer lead to the formation of oblique disturbances in the flow. These represent a combination of compression and expansion waves, whose intensities can be two orders higher than that of external harmonic disturbances. The patterns of the three-dimensional flow over the plate are presented and the structures of the turbulent flat-plate boundary layers are described for the freestream Mach numbers M = 2 and 4. Original Russian Text © I.I. Lipatov, R. Ya. Tugazakov, 2018, published in Izvestiya Rossiiskoi Akademii Nauk, Mekhanika Zhidkosti i Gaza, 2018, No. 2, pp. 113–119.